The center of one of the largest cities in the world – Mumbai – is just 10 kilometers away from the small, forested Elephanta Island. Forests and cliffs of this island hide magnificent secrets – Elephanta Caves, giant chambers hewn in a solid cliff and adorned with some of the most magnificent stone carvings known to be made by ancient man. 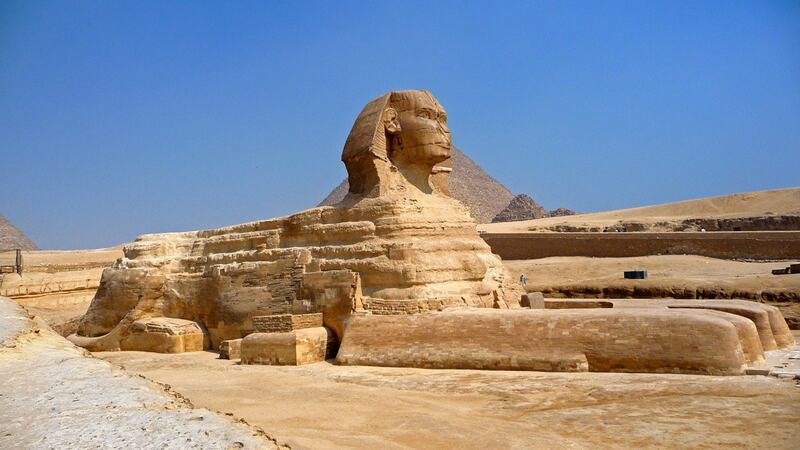 Nobody knows for sure when and by whom these amazing monuments have been created. Whole caves with pillars and the beautiful artwork were made as giant sculptures – by a precise carving of the solid basalt and removing it. Elephanta Island is located in the silted Thane Creek, surrounded by the busy everyday life of the Mumbai Harbour. The island is roughly 10 km2 large at high tide and approximately 16 km2 large at low tide, approximately 2.4 km long. Deep ravine goes from the north to south through the island with basaltic trap hills in both sides rising up to 173 m high. Three small, densely built-up villages are located closer to the shores of the island but for the most part, the island has preserved rural landscape. The whole island is the UNESCO World Heritage Monument. Gharapuri is also the older, local version of the name of Elephanta island – although an even older version was Agraharpuri. Two groups of rock-cut cave temples are located in an island – five Hindu caves and two Buddhist caves. Hindu caves are located more to the west, while the high hill to the east from ravine contains a brick stupa on top and two Buddhist caves with few rock-cut cisterns. Caves were hewn in solid basalt – hard work even for contemporary tools. Initially, caves were painted in bright colors – now the paint is gone and only traces of it remain. 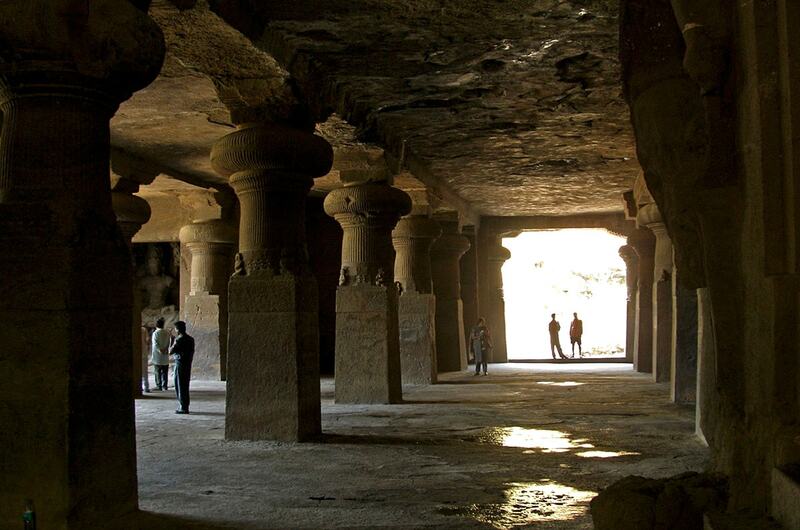 Architectonic features of Elephanta cave chambers and their details suggest that cave chambers were made in the time period between the 5th – 8th centuries AD. Earlier there existed an inscription in the caves or near them informing about the builder of caves – but it has been lost later, during the Portuguese times. Popular legend states that caves were definitely not built by people but rather by mythical beings: either by Pandavas – legendary heroes of Mahabharata or by Banasura – very powerful demon. Archaeological investigations have resulted in a find of few Kshatrapa coins from the 4th century AD – but this does not directly mean that caves have been made in this time. 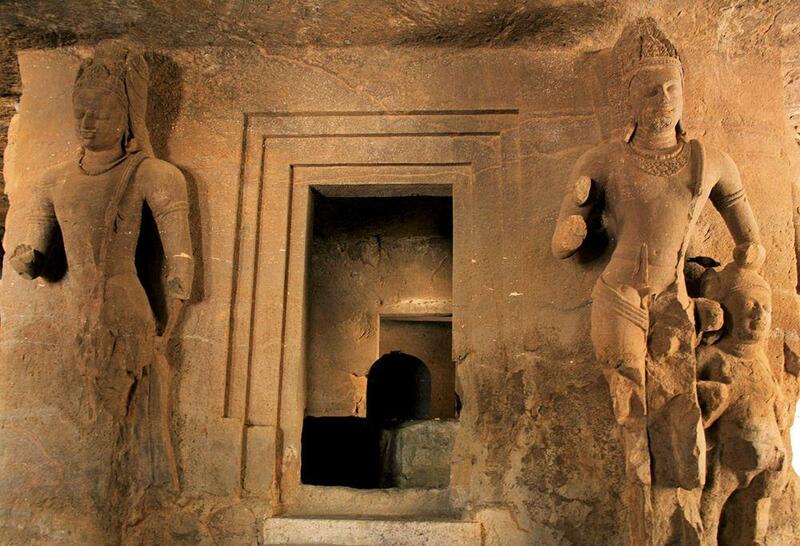 One likely creator of caves is Konkan Mauryas – a break-away group of Mauryan dynasty. Elephanta by that time was called Puri or Purika and was a capital city. Thus it is possible that caves were shaped in the middle of the 6th century by Mauryas. This is put in doubt by some researchers – Mauryan state at this time seemed to be not that powerful and influential to create such an amazing monument. 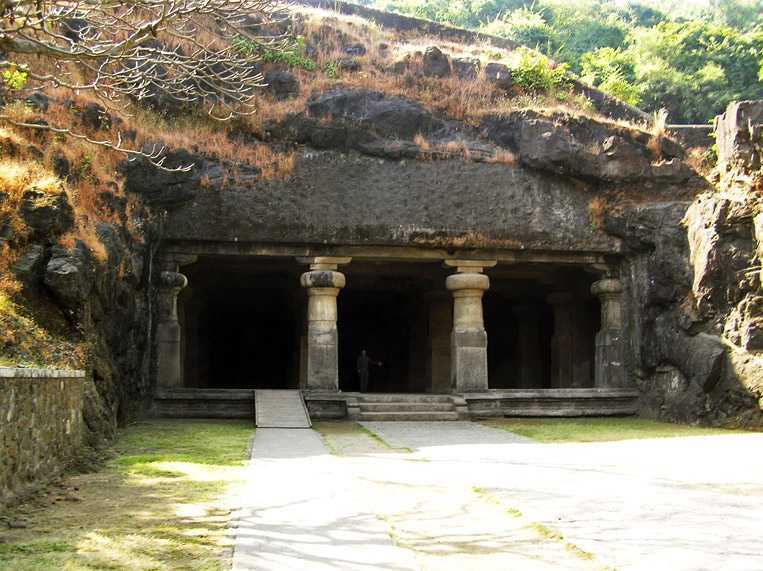 It is also possible that caves were built by early Kalachuri kings – they were feudal to Konkan Mauryas. 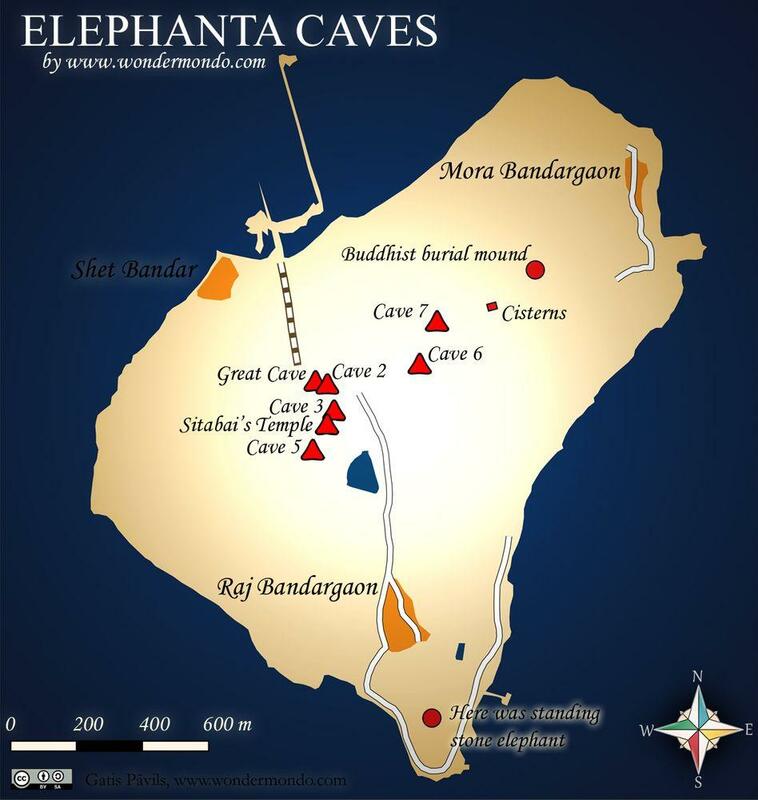 Both Kalachuris and Konkan Mauryas were followers of a Pahsupata Shaivism sect – and also the main cave temple in Elephanta is dedicated to this sect. In 635 AD Badami Chalukyas under the great emperor Pulakesi II defeated Konkan Mauryas in a naval battle. It is possible that Chalukyas took active part in the development of the main cave in the middle of the 7th century as well. Later throughout the centuries the island was owned by different rulers and most likely temple activities continued as well. Bahadur Shah of Gujarat was the last indigenous ruler of Elephanta Island before Mumbai and its surroundings were appropriated by Portuguese in 1534. Portuguese named the island Elephanta after an impressive sculpture of elephant made in black stone. Back then this sculpture was standing on the mound to the east from Gharapuri village. Elephant collapsed in 1814 and was brought to Victoria Gardens and reassambled. Now it is located in Jijamata Udyaan zoo in Mumbai. Portuguese rule was disastrous for Elephanta. Population on island declined and the island became forested. After thousand years long worship the Shiva temples in caves were abandoned as well. The only religious event which has survived to this day and is related to ancient cave temples is the festival of Shiva – Maha Shivaratri. Even worse – Portuguese used the beautiful sculptures in ancient cave temples for target practice. Most of statues were heavily damaged. In 1661 the island became a part of the British Empire but cave temples remained abandoned. Time did its work – water found new paths through the cliff, gradually eliminating the achievements of ancient art. As the popularity of non-European art rised, many valuable details perished in private collections and gradually lost the track of their history. After long years of neglect the Great Cave was renovated several times throughout the 20th century, notably in the 1970s. 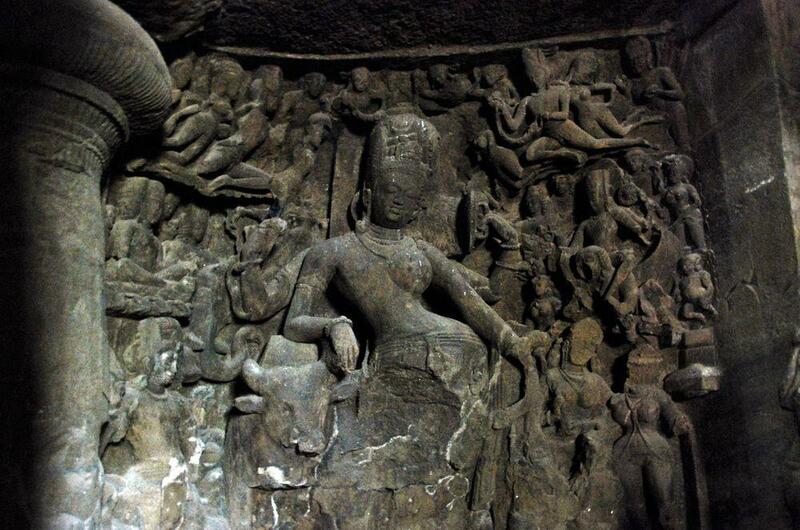 Unfortunately the other caves, including three caves with important sculptures, are badly damaged. In 1987 Elephanta Caves were declared as UNESCO World Heritage site. This beautiful cave temple (named also Cave 1, Shiva Cave, Mahesha-Murti Cave) is located in hillside and is facing the ocean. Floor area of this cave is 5.600 m2, it goes 39 m deep into the basalt cliff. This cave is extremely rich with enormous, beautiful sculptures, some of these sculptures serve as symbols to whole ancient India. In some aspects the Great Cave resembles the 8th century Kailash Temple in Ellora Caves – often there is considered that artists in both sites could be the same. Cave was used as a Hindu worship place until the Portuguese rule. Northern entrance to temple has 1000 steep steps starting from the quayside. Entry in the cave temple leads through impressive portal with massive columns. Entrance is aligned to north-south axis what is unusual – in general Shiva temples have east-west orientation. This cave unites the elements of Chalukyan architecture – like the massive figures of the divinities and guardians and square pillars with custom capitals which in turn have Gupta architectural features – depictions of mountains and clouds, women’s hairstyles. Main chamber (mandapa) of the cave is supported by rows of impressive pillars, each side of mandapa is approximately 27 m long. Beautiful carvings with Shiva in several forms cover each wall in the mandapa, each carving is more than 5 m high. Cave suffered serious damage during the Portuguese times, most of sculptures were damaged by shooting. Happily the enormous, unique Trimurti sculpture was spared. Inside the mandapa, to the right from the entrance there is located the central Shiva shrine – free-standing square cell with four entrances and linga in the centre. Each of the four entrances in Shiva shrine is guarded by two dvarapalas – 4.5 – 4.7 m high gate keepers. Their task is to keep the ill-intentioned visitors away. Sadly these stone giants did not perform their duties during the Portuguese times. At the east and west end of the cave there are smaller shrines – the eastern one serves as a ceremonial entrance. The most renowned sculpture in mandapa of the Great Cave is Trimurti (Trimurthy) – sculpture with three faces of Shiva. It is located on the south wall of mandapa and is 6.1 m high. Trimurti resembles a Trinity of Brahma, Vishnu and Mahesh (Shiva) – royal insignia of Rashtrakutas. The image depicts a three-headed Shiva – each of the heads represents one of essential aspects of Shiva – creation, protection and destruction. Creation (Vamadeva) looks to the right, it is shown as a young, lively, vital women (?) with sensuous lips, holding something like a rose bud in hands. Destruction (Rudra-Shiva, Aghora, Bhairava) to the left, to east is shown as a young, moustached man, displaying anger. Central face (Tatpurusha) is benign, meditative, praying for the preservation of humanity, he is master of positive and negative principles of existence. Trimurti is one of symbols of Indian culture, a masterpiece of Gupta – Chalukyan art. Trimurti is flanked by sculptural groups called Ardhanarisvara on its left and Gangadhara to its right. Gangadhara is 5.2 m high and 4 m wide. It shows divinities assembled around Shiva and Parvati. The 5.11 m high Ardhanarishvara depicts a four-armed Shiva. Shiva is shown as a half male – half female. Cave contains several more carvings of general importance to world art history including a carving of Shiva and Parvati on Mount Kailash with numerous other characters and detailed landscape features. In total there are 15 enormous panels containing art values. Portico of the eastern part of the cave is guarded by seated tigers – resembling later seated lions popular up to the 19th century in European manor house designs. Eastern part of cave contains also a giant statue of four-armed gatekeeper with two demons – attendants. On the crest of the hill above the Great Cave there is a broken stone lion, tiger or griffin – possibly one of the guards in the entrances of Great Cave. Some sources say that it was worshipped as Tiger Goddess Vaghesvari. Hindu cave No 2. is located to the south-east from the Great Cave. It is facing east, with a chapel in its northern end. Portal of the cave is destroyed, the interior has been damaged by water. The irregular chapel is supported by 4 eight-cornered columns and 2 demi-columns. Traces of sculptures remain but most of the previously rich artwork has perished. A little further to the south there is cave No 3. in even worse condition, damaged by stagnant water. Pillars in the front of rooms have been preserved, sculptures of door-keepers of the shrine are partly preserved. Near the caves in earlier times there have been found some sculptures – f.e. large sculpture of horse which disappeared in the middle of the 18th century. Across the top of the ravine from Cave 1 there is a large cave chamber – Sitabai’s Temple. Portico of this chamber has four pillars and two pilasters. Behind the hall there are three chambers, the central chamber hosted shrine. The cave contained beautiful and impressive adornments up to the Portuguese rule but now rather little remains, although cave still contains valuable sculptures. To the north from Sitabai’s cave there is small Hindu cave No 5. with verandah, it has been abandoned soon after the start of construction. The 173 m high Stupa Hill is located in the eastern part of island. It contains two caves with Buddhist monuments and also cisterns from the 3rd century AD or earlier. One of two caves is not complete. In the other cave there is stupa made in bricks. Island contains also other remnants of buildings and artwork – after all this was a place for capital city in ancient times. This category includes outstanding rock cut architecture and large rock cut sculptures. 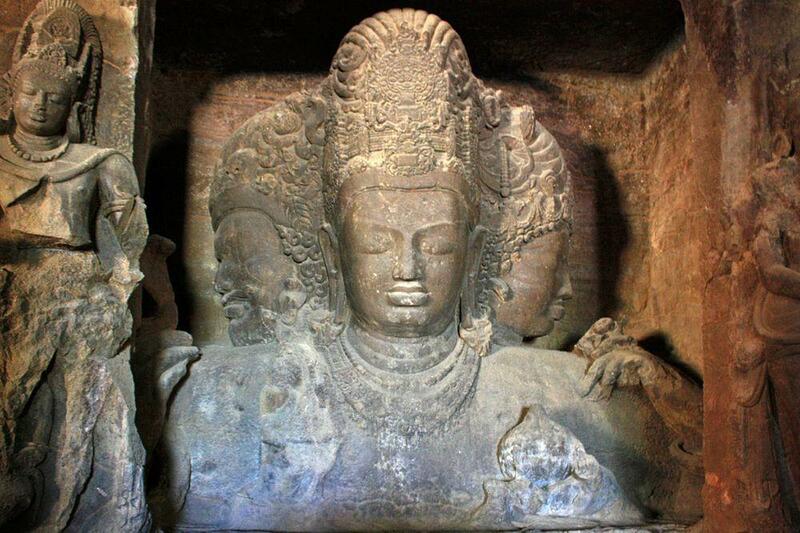 With more than 130 high-resolution images, maps and a detailed tour itinerary, this is the definitive guide to India’s ancient caves: Ellora and Ajanta near Aurangabad and Elephanta in Mumbai.